In a medium size bowl, combine the flour, baking soda, cinnamon, salt, cloves and nutmeg and set aside. In a large bowl, cream together the butter and brown sugar with an electric mixer on medium speed until fluffy. Add the egg and beat on low speed until incorporated. Gradually add the flour mixture and beat on low speed after each addition until combined. With a spoon, stir in the apple cider, apples, walnuts and raisins – the cookie dough will be quite chunky. Drop by rounded teaspoons onto a parchment-lined baking sheet 2 inches apart. Bake for 15-20 minutes, or until golden brown and no longer doughy to the touch – ovens vary with temperature, so pay close attention to the first batch and you’ll have your time down for future batches. Cool on a wire rack; glaze when cool (optional). If making glaze, combine the confectioners’ sugar, apple cider and butter in a small mixing bowl, using a whisk. Take a fork and dip it into the glaze. Hold the fork over each cookie, waving it back and forth and letting glaze drip off the tines onto the cookies, making a zig-zag effect. Let the glaze completely dry before moving the cookies to a storage container (about 20 minutes). In Recipes-list.com we have selected the most viewed recipes from category - uncategorized . Enjoy the best recipes specially selected for you! 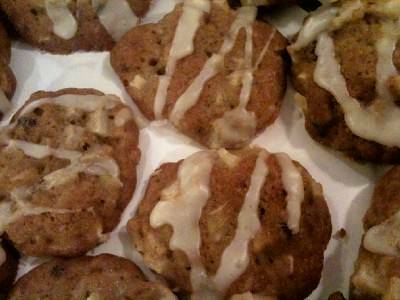 Apple Spice Cookies is the right choice that will satisfy all your claims.